2020 5th International Conference on Multimedia and Image Processing (ICMIP 2020) will be held in Sri Lanka during January 10-12, 2020. ICMIP has been held successfully in Bandar Seri Begawan(Brunei Darussalam), Wuhan(China), Guiyang(China), and Kuala Lumpur(Malaysia) in the last three years respectively. The objective of ICMIP is to present the latest research and results of scientists related to multimedia and image processing topics. This conference provides opportunities for the different areas delegates to exchange new ideas and application experiences face to face, to establish business or research relations and to find global partners for future collaboration. We hope that the conference results constitute significant contribution to the knowledge in these up to date scientific field. ICMIP 2019 conference proceedings has been has been available in ACM Digital Library. 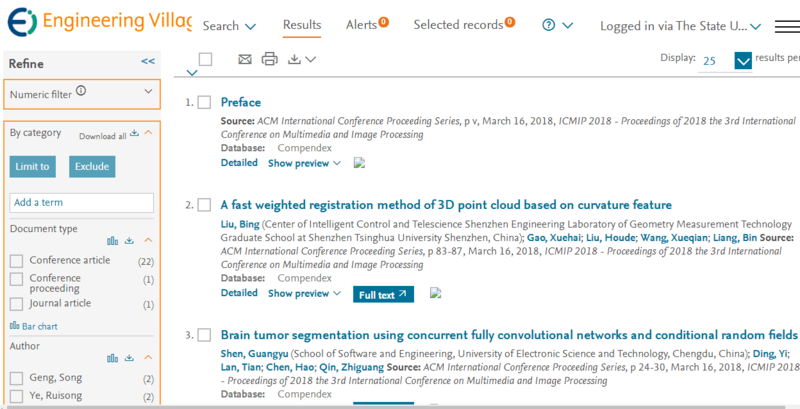 ICMIP 2018 conference proceedings has been has been available in ACM Digital Library and indexed by Ei compendex and Scopus already. ICMIP 2017 conference proceedings has been included in IEEE Xplore and indexed by Ei compendex and Scopus already. ICMIP 2016 conference proceedings has been included in IEEE Xplore and indexed byEi Compendexand Scopus already. Full paper/Abstract submission by Easychair Submission System. Note: * The full paper submission should be no less than 5 pages. Please prepare your paper according to the paper template. If you'd like to attend the conference without paper publication and presentation, please donwload the listener registration form and make the registration directly. Reviewers evaluate article submissions to ICMIP 2020, based on the requirements of the conference proceedings, predefined criteria, and quality, completeness and accuracy of the research presented. They provide feedback on the article and the research, suggest improvements and make a recommendation to the editor about whether to accept, reject or request changes to the article. Please submit your CV to Conference Secretary Ms. Sukie Yao via icmip2016@vip.163.com. Feel free to contact Ms. Sukie Yao for the sponsorship via: icmip2016@vip.163.com.